Quick Access Bar is a lightweight program for Windows that adds a toolbar with folder links to the top of the Windows desktop. 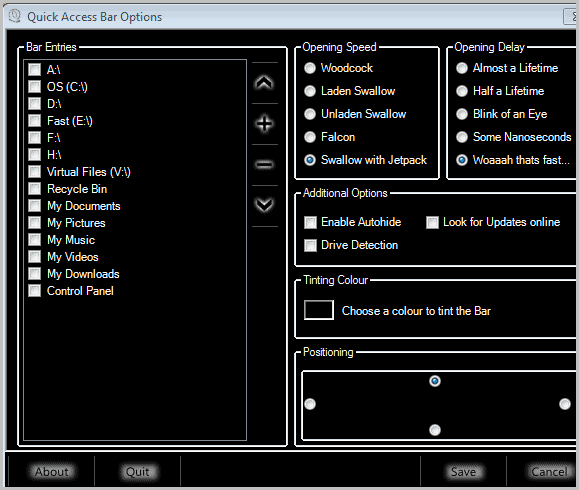 The toolbar is displayed all the time by default, with options to auto-hide it in the program options. You first need to configure the folders and entries that you want to have quick access to in the program options. The program displays pre-selected entries that include all hard drives and optical drives of the system, plus often used folders like the My Documents folder, the Recycle Bin or the Control Panel. The plus button on the right of that section in the options opens up a file and folder browser so that every file or folder that is accessible on the system can be added to the toolbar. The options hold settings to change the opening speed and delay, the color of the toolbar and its positioning. Instead of snapping it to the top, it is possible to snap it to the bottom or side of the desktop as well. Especially the display on the sides will take some getting used to time as it is difficulty to read the file and folder names in this layout. A click on a folder in the bar opens that folder in Windows Explorer. Files are executed automatically instead. There is no real need for the Quick Access Bar under Windows 7 anymore, as users can add the files and folders that they access regularly to the Windows 7 taskbar. Windows XP or Vista users on the other hand might like the idea of another option to quickly open folders or load programs with the help of this bar. I have a few minor issues with the bar, like the previously mentioned difficulty to read the folder or file names in sidebar mode. Another issue is the lack of customization of the font and its effect. Options to configure the font color and layout are missing. Windows users who would like to give Quick Access Bar a try can download it from the developer website. the program is compatible with all recent 32-bit and 64-bit editions of the Windows operating system.